His Divine Grace Om Vishnupad Srila Bhakti Nirmal Acharya Maharaj visits the temple in Kadigachha and supervises the rapid progress of the finishing construction of Lord Siva's temple. Sharing photographs taken this afternoon around the serene surroundings of the temple of Sri Sri Guru Gaura Nityananda Prabhu at Sri Ekachakra Dham. An ePub file for offline reading on mobile phones and tablets containing the lectures of His Divine Grace Om Vishnupad Srila Bhakti Nirmal Acharya Maharaj published here from October to December 2018. We pray this serves as a source of guidance, nourishment, and life to all the devotees and well-wishers worldwide. "By neglecting the lotus feet of Nityananda Prabhu all sadhana or bhajan (spiritual practices, services or worship) become an illusion, just like a dream. I worship and adore with all my heart that gracious giver of Sri Gaura, the benevolent bestower of His shelter to the fallen souls—Sri Nityanandachandra." 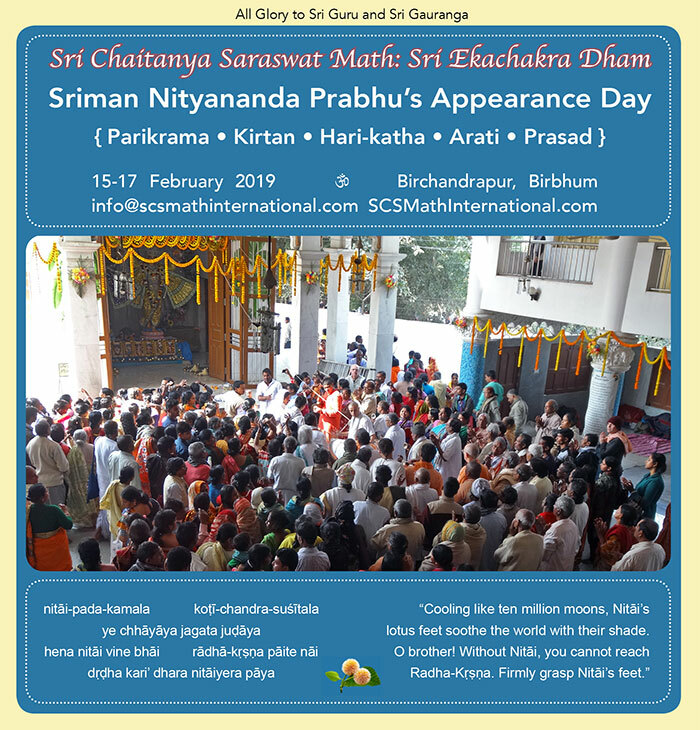 On behalf of His Divine Grace Om Vishnupad Jagad-Guru Srila Bhakti Nirmal Acharya Maharaj, we humbly bow at your holy feet and extend a cordial invitation to please come and join the annual Festival of Sriman Nityananda Prabhu's appearance day that is manifest on 15-17 February 2019 this year and shall be held at Sri Ekachakra Dham. Special programmes of worship, kirtan, parikrama, lectures, prasad distribution, as well as many other devotional activities will be held during the Festival. We shall feel obliged to have the kind company of you and your friends to enhance this great annual festival at our Sri Chaitanya Saraswat Math Temple in Sri Ekachakra Dham, as well as the branches worldwide. "Krishna has given all His power to our Gurudev, and all you need to do is to listen properly to his advice, his order. We are not independent. If we do some service under the guidance of Guru and Vaishnav, then we can realise everything properly." «Кришна наделил Гурудева всей Своей силой, и все, что вам нужно, — это как следует слушать его совет, его указание. Мы не независимы. Если мы будем служить под руководством Гуру и вайшнавов, тогда мы сможем понять все как следует». 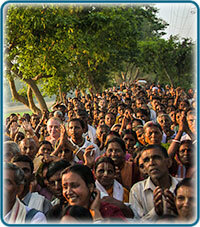 "Who can understand the extent of Nityananda Prabhu's help to us? We can understand easily how merciful Gurudev is, how kind Gurudev is to us. He is giving us, presenting us such good things. We must only accept it." «Кто способен понять, как сильно Нитьянанда Прабху помогает нам? Мы можем с легкостью понять, как милостив Гурудев, как добр Гурудев по отношению к нам. Он дает, дарит нам такие хорошие вещи. Мы лишь должны принять их». "We should not bargain with the Guru—when Gurudev tells you something, you should listen properly and show with your action, with your service that you are a proper servitor of your Guru. You must show your Guru with your actions, 'I am not independent.'" «Мы не должны торговаться с Гуру: когда Гурудев говорит вам что-то, вы должны слушать как следует и показывать своими поступками, своим служением, что вы действительно слуга своего Гуру. Вы должны своими поступками показать Гуру, что „Я не независим“». His Divine Grace Om Vishnupad Srila B.N. Acharya Maharaj visits Sri Ramananda Gaudiya Math and the holy bank of Sri Godavari River on the third day of his South Indian preaching tour. There, His Divine Grace graces the fortunate souls with the extensive narrations of exclusive pastimes of Raya Ramananda and Sriman Mahaprabhu. The second day of the South Indian finishes with arati, kirtans, and a lively evening class at the house of Sri Padmavati Devi Dasi. In the afternoon on the second day, devotees take His Divine Grace to Mangalagiri, about twenty-five kilometres to the south-west of Vijayawada to visit the temples of Lord Nrisinghadev and Sriman Mahaprabhu. After quite a few years, His Divine Grace Om Vishnupad Srila Bhakti Nirmal Acharya Maharaj travels again to Andhra Pradesh (South India) on a preaching tour in the company of Their Holinesses Sripad B.N. Shanta Maharaj, Sripad B.V. Muni Maharaj, Sripad B.A. Paramarthik Maharaj and a few accompanying servitors. Sharing photographs from the first evening programme hosted by Sripad Venkata Krishna Prabhu. "We use our life to do nonsense thinking that we will go to heaven... This is not right because we all have come from the same family. We are now separate, going here and there because of our karma, but we must remember that we must get to our destination." «Мы тратим жизнь на несуразные вещи, думая, что попадем в рай... Это неправильно, потому что мы все из одной и той же семьи. Сейчас мы разрознены и скитаемся от места к месту из-за кармы, но мы должны помнить о том, что мы все должны добраться до нашей цели». "You must always do Vaishnav seva—without service to the Vaishnavs we cannot proceed in our spiritual life. How can you do Vaishnav seva? Vaishnav seva means following the order and advice that a Vaishnav gives you." "We have all come from the same family. Wake up! This is not your real home! How many days will you stay here? We have all come from the same place—you have come from Me, and I have come to take you there!" "We keep coming and going, we are always changing our address, but now that we have got a human body. If a fortunate soul can take and chant the Holy Name, they can go to their real home, it will not be necessary for them to suffer any more." "So, I am praying to everybody—Mahaprabhu brought Harinam-sankirtan, this is your medicine, take it. If you take this medicine, you will be rescued from this world. When you get a good doctor and good medicine, your disease will be removed. How is it possible?" "You must serve the devotees. Gurudev said, 'If you serve devotees, Krishna will come and serve you.' Why is it necessary to take initiation, why is it necessary to take a Guru? Why do we go to the temple?" "You know that Radharani did not study at Cambridge or Oxford University—simply through service, through chanting, She captured the heart of Krishna. When you go to Goloka Vrindavan, there will be no kartals, no mridanga, only clapping and chanting." "The Lord can change everything. You think something is impossible, but nothing is impossible, anything can happen. But it all depends upon your faith. If you have the strongest faith and you surrender fully, then you will get a real benefit." "If somebody wants to take this Holy Name, I am ready—Gurudev gave me this position to serve you all. It is not necessary to bring money, you can bring a few fruits, this is sufficient. We are not asking anyone for money—we are asking for your love and affection." "It is necessary to cultivate your heart, to make it fertile. You have got a good seed, and you must increase, must grow your bhakti-lata-bij through sravanam-kirtanam. Only by chanting the Holy Name can you get the real benefit and go to your real home..."
"Worshipping Lord Ramachandra was in Treta-yuga, but we live not in Treta-yuga—we live in Kali-yuga and we must know what is the dharma of Kali-yuga. It is not like the tradition to come to a temple, pay dandavat and go. We must practise properly." "If you want to get great things, you must give up small things. We always run behind kanak (money), kamini (companions), and pratistha (name and fame), always worry, "How will I get everything?" But we have only three duties..."
"You should come and practise. It is not necessary to think so much—you will not get the taste just by watching a football match, you must come and play football, play and enjoy with us!" Why do they offer coconuts to the Lord? Does breaking coconuts symbolise breaking the ego? If we want to go to heaven, what are the necessary qualifications? Why is bhakti necessary? "There are so many faults in the age of Kali, but there is also one great quality in it: Krishna Himself comes in the form of His Name. If we take shelter of the Holy Name—if we chant properly, without offence—then we can understand the real truth." His Divine Grace Om Vishnupad Srila Bhakti Nirmal Acharya Maharaj gives first and second initiations and after prasadam leaves for the next city scheduled for his South Indian tour. His Divine Grace arrives in Masulipatnam and continues the preaching tour with the incessant merciful flow of Hari-katha and sankirtan, carrying the victorious banner of Sri Chaitanya Saraswat Math door to door, heart to heart: "As long as I have life in this body, I will go door to door telling, 'Krsna bolo, sange chala, ei matra bhiksa chai. I am begging you for one thing only: come with us and chant 'Krishna'! Come, come for Nabadwip Dham parikrama in the association of devotees!" «В эпоху Кали существует множество недостатков, но в ней также есть и одно великое достоинство: Кришна Сам лично приходит в облике Святого Имени. Если мы примем прибежище в этом Святом Имени (если будем повторять Его правильно, без оскорблений), тогда мы сможем понять настоящую истину». «После даршана Нрисингхадева Махапрабху сидел здесь в этом месте. Вы можете увидеть здесь отпечатки стоп Господа Шри Чайтаньи Махапрабху. Этот храм открыл Шрила Бхактисиддханта Сарасвати Тхакур. Мы очень удачливы, что пришли сюда». "When we are born, our mothers tell me, 'This is your father,' and we believe it because only the mother knows who the father is. In the same way, we must believe properly what the scriptures say." Photographs taken during the last day of the South Indian tour: His Divine Grace Om Vishnupad Srila Bhakti Nirmal Acharya Maharaj visits devotees' home with sankirtan and gives the last evening class at the house of Srivas Prabhu before going back to West Bengal. «Когда мы рождаемся, мама говорит нам: „Это твой отец“, — и мы верим этому, потому что только мать знает, кто отец. Точно так же мы должны верить как следует и тому, что говорят писания». "With his nectarean teachings, Srila Jiva Goswami Prabhu revealed the Supreme Lord, Krishna, whose effulgence had been hidden by the quicksand of calculation, the dust storm of fallacious logic, and the ditch of illusionism. May he be my shelter." "I have no power to say what kind of devotion to his Guru Jiva Goswami had. Jiva Goswami's service cannot be compared to anyone's service. Whatever order he would get, he would place it on his head and do it all the time—his mind never went to any other place." "Srila Jiva Goswami Prabhu did everything alone—he cooked, did puja, cleaned the temple, brought water from the Yamuna, and also did personal service to his Guru. He was busy with his service from morning to night, and did everything alone." Srila B.S. Govinda Dev-Goswami Maharaj explains the pranam-mantra of Srila Jiva Goswami in the book Dignity of the Divine Servitor: "I offer my full dandavats unto the lotus feet of Srila Jiva Goswami who is the protector of our spiritual life. He rescues us from the whole illusory environment..."
"Not finding the association of Sri Gauranga, who performed His Pastimes with all these associates, Narottam Das weeps." «Какое послание я приехал донести до вас? Я хочу постараться донести до вас то послание, которое несли Шрила Бхактисиддханта Сарасвати Тхакур, наш Гурудев и наш Гуру Махарадж. Я хочу дать вам „Скрытое сокровище Милого Абсолюта“». Tirelessly continuing the preaching programmes, His Divine Grace Om Vishnupad Srila Bhakti Nirmal Acharya Maharaj sets off for Sri Chaitanya Saraswat Math in Sri Ganga Sagar to observe the Deity installation festival. The devotees in Ganga Sagar have the joy of having His Divine Grace's darshan and association mostly only once a year, so this visit has been long awaited. Photographs from the festival in Sri Ganga Sagar Math observed at the holy lotus feet of His Divine Grace Om Vishnupad Srila Bhakti Nirmal Acharya Maharaj in honour of the fourth anniversary of the temple inauguration: kirtans, class, arati and prasad-seva are among the many services devotees take part in on this auspicious day, a few devotees also receive first and second initiations. «Все в этом мире существует для наслаждения Бога. Из-за эго мы все время думаем, что что-то принадлежит мне. Ничто в этом мире не принадлежит вам. Если вы думаете, что все принадлежит вам, и вы наслаждаетесь всем, это означает, что вы находитесь под влиянием Майи Деви». «Ни рай, ни ад не являются нашим постоянным, настоящим местом. Мы произошли от Бога, и мы должны вернуться обратно домой: назад домой, назад к Богу. Благодаря служению Богу, благодаря служению гуру, вайшнавам, вы можете отправиться в настоящее место: Голоку». "Mahaprabhu would go in a zigzag way—sometimes He went to the East, sometimes to the West, and the devotees followed Him not knowing where He was going..."
Srila Bhakti Raksak Sridhar Dev-Goswami Maharaj's poem expressing the grief-stricken hearts of the residents of Nabadwip: "Vishvambhar, the son of Jagannath Mishra, who resides in Nabadwip, Sachi's Nimai, has taken sannyas. A tumult of cries filled the sky—Sachi's Nimai has taken sannyas!" "Sri Gaurasundara departed from Nabadwip and went away to become a sannyasi (monk), leaving behind his family members and friends whose eyes were filled with tears. He accepted the staff and waterpot as his only possessions, the emblems of a renunciate. When his long hair was cut off and his head was shaved, thousands of voices sang the holy names. The devotee's eyes shed rivers of tears, since they knew he was going into the world and leaving them behind. From that time, whoever saw him in the red garments of a sannyasi cried out loud in grief. I sing with joy the unending glories of my sweet Lord, my golden Gaurasundara, the one and only divine abode of pure love." «У вас в сутках есть двадцать четыре часа, но эти двадцать четыре часа — не для вас. Присоединившись к семье Кришны, вы можете задействовать себя двадцать четыре часа в сутки в служении Гуру. Те, кто получил посвящение, должны не только повторять Святое Имя сами, но еще и проповедовать». "By His causeless mercy the full moon Gaurahari arose in the district of Nadia, which is compared to Udayagiri, where the sun first becomes visible—His rising in the sky destroyed the darkness of sin; all three worlds became joyful and chanted the Holy Name of the Lord." On behalf of His Divine Grace Om Vishnupad Srila Bhakti Nirmal Acharya Maharaj, the Sevaite-President Acharya of Sri Chaitanya Saraswat Math, we are humbly bowing down at your holy feet and extending an invitation to join our Sri Chaitanya Saraswat Math during the annual week-long grand festival celebrating the Divine Appearance of Lord Gaurasundar. The parikrama shall take place on 16-22 March 2019 this year. While attempts are being made to have the festival held at Sri Nabadwip Dham (the headquarters), in case this does not prove feasible as yet, the parikrama and all programmes shall be held in full while being based in Sri Nrisingha Palli as last year. 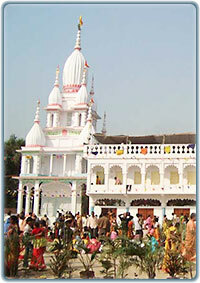 16 March Adhivas (eve) of the festival of Sri Nabadwip Dham Parikrama. 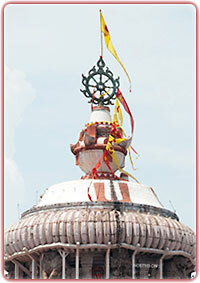 17‑20 March Parikrama of the nine islands of Sri Nabadwip Dham. Evening Hari-katha (classes) from the holy lotus mouth of Sri Gurupadpadma and Vaishnavs. 21 March Main Celebration: Sri Gaura Purnima Festival (divine appearance of Sri Gauranga Mahaprabhu). Day-long Hari-katha, kirtans, reading from the scriptures, services around the temple. Fast until moonrise, followed by a special arati and prasad-seva. 22 March Anandotsav of Sri Jagannath Mishra. Every year we anxiously await this very special festival and joyfully witness and partake in numerous devotional programmes and services. Offering worship, parikramas, kirtans, lectures, prasad-seva and many other devotional activities are held during these days. Bowing at your feet, we kindly request you to find it possible to come and join Sri Chaitanya Saraswat Math for this week. We shall feel obliged to have your and your friends' kind company at this time. Shall you have any enquiries or wish to notify us of your arrival, we will be happy to hear from you at . «Служение означает, что вы должны все устроить, предоставить, тогда это будет правильным, настоящим служением. У вас может быть хорошее сердце, но необходимо также знать некоторые правила и предписания. Когда человек совершает апарадху (оскробление), ему приходится за это страдать». «Если вы ходите от дома к дому, но при этом сами не практикуете как следует, тогда люди не дадут вам даже одну рупию. Поэтому вам нужно правильно практиковать, нужно вести себя правильно: вы должны стать преданным. „Преданный“ подразумевает следование учению Махапрабху. Мы приходим в сознание Кришны для того, чтобы удовлетворить Гурудева, а не для того, чтобы удовлетворить самих себя». Honouring the invitation of the devotees, His Divine Grace Om Vishnupad Srila Bhakti Nirmal Acharya Maharaj comes to Sundarpur (Murshidabad district) to preach to the devotees and friends of the community and give several initiations to new devotees. After Sundarpur, Sri Gurupadpadma travels to Sri Ekachakra Dham, a little further to the north. Arriving rather late in the evening, His Divine Grace takes the darshan of Sri Sri Guru Gaura Nityananda Prabhu and gives evening class before retiring to rest. «Вы думаете: „У меня так много проблем, я так страдаю, поэтому я должен предаться Богу“, — это не преданность. Предаваться нужно всей душой и сердцем, с преданностью. Предоваться нужно для того, чтобы любить Бога». His Divine Grace Om Vishnupad Srila Bhakti Nirmal Acharya Maharaj sets off from Sri Ekachakra Dham in the morning to attend further preaching programmes organised by the devotees in Ishwarpur and Bolpur, about 40 km and 60 km to the south of Sri Ekachakra Dham, respectively. His Divine Grace went there last time a year ago, so the devotees are overjoyed to have the darshan of the holy lotus feet of His Divine Grace and hear his Hari-katha. «Ум всегда непослушен, он всегда что-то хочет. Когда вас беспокоит ум, громко повторяйте маха-мантру Харе Кришна, тогда ум сосредоточится на Боге». «Как служить Богу? Приходите к тому, кто является самым дорогим слугой вашего Гуру, и предавайтесь такому вайшнаву, он даст вам правильные наставления. Читайте книги, молитесь Богу, и таким образом помнить о Нем. Лучшая практика — это шраван и киртан». "ভূল সিদ্ধান্ত নিয়ে কোন সময় চলবে না । অধিকার আগে অর্জন করতে হবে । আমাদের গুরু-ভক্ত হতে হবে, গৌর-ভক্ত হতে হবে, রাধারাণীর ভক্ত হতে হবে, তারপর তো কৃষ্ণভক্ত হব । আমরা কৃষ্ণপ্রেমদান পাব তো দূরের কথা, ব্রজগোপীদের দাসী হতে পারলাম না আর আমরা বলি কৃষ্ণপ্রেমদান পাব । হবে না ।"
"You have heard about the Deity of Sri Radha-Raman in Vrindavan. When Gopal Bhatta Goswami lived in Vrindavan, he every day worshipped twelve pieces of Govardhan sila..."
"I offer my respectful obeisances unto the Six Goswamis, namely Sri Rupa Goswami, Sri Sanatan Goswami, Sri Raghunath Bhatta Goswami, Sri Raghunath Das Goswami, Sri Jiva Goswami, and Sri Gopala Bhatta Goswami, who are always engaged in chanting the Holy Name of Krishna and dancing. They are just like the ocean of love of God, and they are popular both with the gentle and with the ruffians, because they are not envious of anyone. Whatever they do, they are all-pleasing to everyone, and they are fully blessed by Lord Chaitanya. Thus they are engaged in missionary activities meant to deliver all the conditioned souls in the material universe." "You must see the sadhu with your ears. Every day you sing, 'Ramachandra-sanga mage Narottama Dasa: Narottam Das prays for the association of Ramachandra Kaviraj.' What does this mean? Why does Narottam Das always ask for the association of Ramachandra?" "O Srinivas Acharya Prabhu! Be merciful! Narottam Das prays for the association of Ramachandra Kaviraj." "Where are my Raghunath Bhatta and Gopal Bhatta? Where is my Ramachandra Kaviraj? Where has the great dancer Sri Gauranga suddenly gone?" "...He was a senior man, he was very experienced and honourable, but he treated me with humility and all his other good qualities. Later, I was his servant for one month in Vrindavan. Sometimes Srila Guru Maharaj told me, 'In the evening, give him a garland.' Guru Maharaj gave him the title 'Bhakti Chandan'." "Today, being separated from the direct affection of Srimat Yadavendu Bhakti Chandan Prabhu, we are bearing jewel-less hearts. Personally, I received so much of his auspicious association. When we have teeth, we do not understand their value. Today, if I could meet him again, then, just by getting a touch of his good association, I would attain even greater good fortune." "সাৎগুরুর চরণে আশ্রয় হয়ে যদি নিত্যানন্দের ভগজ করি, গৌরাঙ্গের ভজন করি, বৈষ্ণব আনুগত্যে তাঁর সেবা করতে পারি, কৃষ্ণভহির্মুখ জীবকে এই পথে এনে তাঁদের সঙ্গে গিয়ে নিতাইগৌর হরিবল বলে যদি আমরা সেখানে পৌঁছাতে পারি, তাহলে আমাদের আর কোন দিন এই জন্মমৃত্যুজরাব্যাধি ভোগ করতে হবে না ।"
"It is necessary to do eternal daily service with sincerity. 'How can I use myself in the service of the lotus feet of my Gurudev? What service can be done through me?' We must think about this at every moment. We must live thinking about this." "By the mercy of Guru and Vaishnavs, by the mercy of the Lord, we have arrived in this Sri Ekachakra Dham where our most beloved Lord Nityananda Prabhu appeared. This is not a matter of small fortune—not everybody gets such fortune." "When you get sick, you see a doctor—the doctor gives you medicine, you take it and get well. Here, to cure your disease of material existence, the doctor actually comes to your house and tells you what things you must avoid to remove your illusory environment." "What do I want? I do not want wealth, knowledge, beautiful companions—all these things that the outside people are so proud of... If you run behind the illusory environment—enjoyment and liberation—Krishna will give it to you, but what will you think after that?" "Remember Nityananda Prabhu's tolerance and patience. If somebody tells you something bad, you become upset, you get angry, but this is not your conception—your Gurudev never taught you this, Nityananda Prabhu never taught you this." "There are so many people, so gurus—they all stand in one line, but Bhakti Devi is guarding the door and does not let anyone enter. Bhakti Devi will let on the boat only those who have devotion, who have earned the qualification, who have the ticket, and others will be denied entry, they will have to go back." "Mahaprabhu gave Gaura-dham, Gaura-nam—He gave everything to Nityananda Prabhu. It is by the unlimited mercy of this Nityananda Prabhu that we have come to His dham and have got this opportunity to chant His glories. Come, come for Nityananda Prabhu." "A thief thinks every man steals. We think that everyone is like us. Some shave their heads during the shraddha ceremony and some shave their heads on Nityananda trayodasi—do you think it is the same?" "Srila Prabhupad also told another story about Lalu and Kalu. We are like that too—even though we are taught to chant the Holy Name, but nobody wants to say Hare Krishna."